Canada’s Prime Minister Justin Trudeau has apologised in parliament for an incident that took place in 1914. It makes good of an eight year promise to Canada’s Sikh communities. The Komagata Maru incident began on May 23, 1914 when a Japanese steamship attempted to dock in Vancouver. It had departed Hong Kong a month earlier. Of the 376 passengers aboard, 340 were Sikh, 12 were Hindu and 24 Muslims from India – also subjects of the British Empire. A Canadian law passed in 1908 prevented the Komagata Maru from docking. Political pressure to pass this legislation came from a variety of sources. Some workers’ unions were concerned that immigration would depress wages and lower job security. Racist ideologues lobbied for a ‘whites only’ Canada. Just a year earlier, Vancouver had seen anti-Asian riots against Chinese and Japanese communities. It resulted in $36,000 in property damage. The Continuous Passage Act required all immigrants to enter Canada on an “uninterrupted journey”. This racist policy favoured European migrants. And discriminated against non-Europeans who faced complicated routes into Canada. Sir Richard MacBride, then Prime Minister of British Columbia, refused to let the ship board. “To admit Orientals in large numbers would mean the end, the extinction of the white people and we have always in mind the necessity of keeping this a white man’s country,” he said. 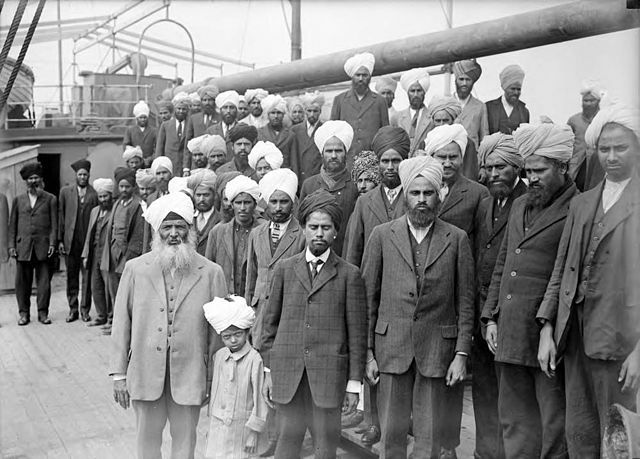 It took two months for the court of appeal to rule against the Komagata Maru passengers. Canada’s navy escorted the ship out of its waters. Just 22 of the 376 passengers were granted leave to remain, having proved residence. One passenger had died from sickness. The conditions of their temporary stay were far from comfortable. The minority of Sikhs who stayed in Canada faced discrimination in employment and housing. Some had to shave their beards and adopt western clothing. Nor could they vote or join the military, according to author Kamala Elizabeth Nayar. The first Indians to settle in Canada were Sikhs from the province of Punjab in 1908. Despite their small size of 5,000 – many faced hostility and resentment after arriving. This racist sentiment extended to other minorities soon after. Racists spread rumours that Punjabis were polygamous, diseased and lacked personal hygiene. In short, they were antithetical to Canadian society. It’s not surprising that Sikh workers often experienced violence as a result. A popular song in parts of British Columbia at the time was ‘White Canada Forever’. A section of the lyrics reads “We welcome as brothers all white men still, But the shifty yellow race, Whose word is vain, who oppress the weak, Must find another place”. The Khalsa Diwan Society, formed two years earlier, built Canada’s first gurdwara in West Vancouver in 1908. The society also promoted political and social activism. In 1909, they had successfully fought against government plans to move Indians to Honduras. By 1912, the society began working with the Hindustan League to protest immigration reforms. Faced with impossible legal barriers to enter Canada, many entered the United States then illegally into Canada. The gurdwara served as their refuge. A legend grew that the gurdwara would signal when it was safe to enter to Canada. Former prime minister Stephen Harper had apologised for the incident at a 2008 Sikh cultural event. But many rejected the apology as inadequate without the parliamentary record. Harper had offered this courtesy to Canada’s Chinese communities in 2006. His parliamentary apology concerned the ‘Chinese Head Tax’ policy, which taxed Chinese migrants entering Canada between 1885 and 1923. The Chinese Exclusion Act of 1923 made it impossible for Chinese migrants to enter. This policy was ditched in 1947, due to its incompatibility with the UN’s Charter of Human Rights. Harbhajan Singh Gill, of the Komagata Maru Heritage Foundation, said further steps were needed. And advocated to educate children about this issue. Relatives of the survivors spoke of their gratitude to Prime Minister Trudeau. The British feared that those aboard had intended to start a rebellion (Ghadar) upon arrival in India. When the Komagata Maru arrived at the Budge Budge on September 27, 1914, the passengers were deemed political agitators. The British wanted to arrest the organiser Gurdit Singh Sandhu and other political ‘agitators’. This political standoff ended in bloodshed as the British killed 19 people who attempted to flee the ship. Those who had successfully fled were tracked down and imprisoned. Others were put under house arrest until World War I ended. Gurdit Singh Sandhu was also in hiding until Gandhi urged him to surrender in 1922. Sandhu spent the next five years in prison on the mere suspicion of rebellion. The Komagata Maru incident rallied Punjabis in North America to form the Ghadar Party, and push for liberation. In 1952, then Prime minister Jawaharlal Nehru inaugurated a monument to those killed in the incident. Many travel great distances to honour the dead each year on September 29. Yet the monument bore no information about the events itself. A new memorial to the victims was announced last year. India’s Ministry of Culture will help fund the project. The new memorial will ‘include artifacts and memorabilia related to the incident‘.